Two Beautiful ATC's Between Two Friends!! Hope your Friday is going well for you!! 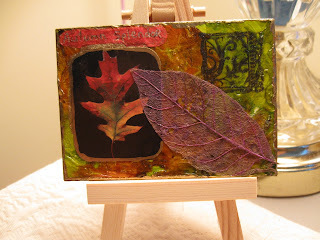 "Autumn Splendor" is the one Jan made for me!!! and used a Gold leaf pen to outline the edges of the cards. never been to GA. before. We had so much fun! I will post some pictures tomorrow! Back to Curves to work off all the great food we had! !